Dunkin’ Donuts Lebanon began in 2011 with a bloom through the online adaptation of the snake game. Dunkin’ Donuts Lebanon offers users a whole new game on its website inspired by the famous snake game that has accompanied the rise of mobile phones 15 years ago. Who has not played the first game on mobile phone where the snake had to catch as many critters as possible, without biting its tail? Who has not spent hours trying to beat the score of a well trained friend? 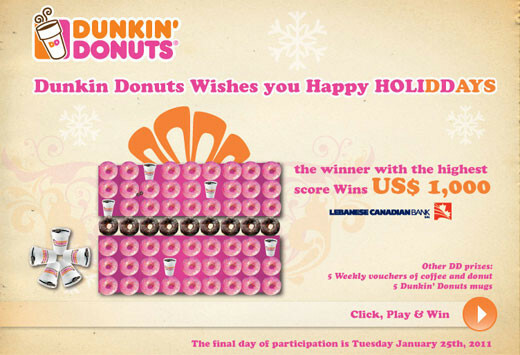 Customers have until January 25 to achieve the best scores on the website of Dunkin’ Donuts Lebanon (http://ddlebanon.com/home.html ). Get to your keyboards and let the best one win! Kim Kardashian to Give Birth in Paris? Get Shady: The Sun is here! Newer Post Miley Cyrus: Good Girl Gone Bad?